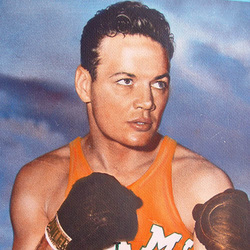 Carl DiBernardo was a one time NCAA light heavyweight champion who also lettered four times as a member of the University of Miami boxing team from 1948 to 1951. DiBernardo's freshman season found him a hard-hitting boxer and managed to win a majority of his bouts. His sophomore year was sensational, we won every bout. His victory carries him to the Southern Intercollegiate Championships where we was named the outstanding boxer of the meet. He went on to the NCAA tournament and again his victories won him the NCAA title. Carl was honored his junior year as team captain and won five dual meets and a draw. As a senior he was asked to compete as a heavyweight where he won three times and won all his light heavyweight bouts. This enabled him to complete three years without a loss.